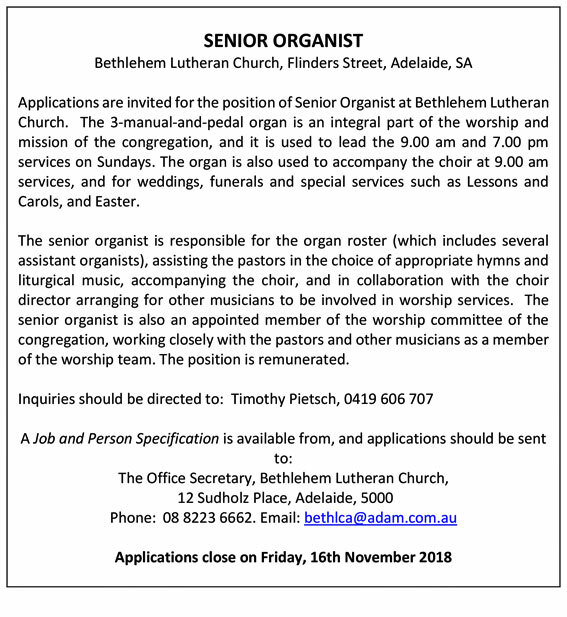 ST.JOHN'S UNITING CHURCH, WAHROONGA is looking for an Organist to play for them at their Sunday Morning Worship Service each week. We have a very special Pels Pipe Organ with 1892 pipes, the only one of its type in Australia. Our service is at 9-30am with a choir rehearsal at 8-30 am prior to the service. The Organist liaises with the Minister and choir about music choices for the week. The choir is currently self-directed and chooses an anthem and introit to sing. Remuneration will be seriously and sensitively considered. For more information please contact Rev. Suzanne Stanton on 0408 659 702. 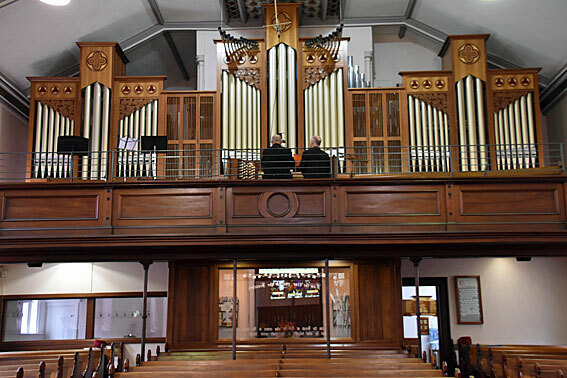 Roseville Uniting Church has established an Organ Scholarship, in memory of two former members of the congregation, to support and encourage emerging organists to develop their skills in pipe organ playing in a church environment. The Scholarship will be granted on a 1 year basis. Applicants for the Scholarship should ideally have attained at least Grade 5 AMEB (or equivalent) in Organ. It is expected that the successful applicant for the scholarship will work with one of the organists at Roseville Uniting Church, meeting at least twice a month during the period of the Scholarship. At times suitable to the Church community, the Scholarship holder will have access to practise on the Roseville Uniting Church organ. The organ is a two manual and pedals instrument originally built by the British Pianoforte Depot Ltd in 1917 and subsequently remodelled in 1961 by S T Noad and in 1981 and 2000 by Peter D G Jewkes. The current organ has 5 speaking stops in each of the Swell and Pedal divisions and 6 speaking stops in the Great Division. Opportunities for playing in worship services and performance will arise, depending on the Scholarship holder's skills and willingness to perform. The David and Lorraine Lusby Memorial Organ Scholarship Fund will pay the successful applicant for the Scholarship an amount of $3,000 per annum, payable in advance by four amounts of $750 on a quarterly basis. Enquiries may be made by contacting Robert Bevan on 02 9810 6898. 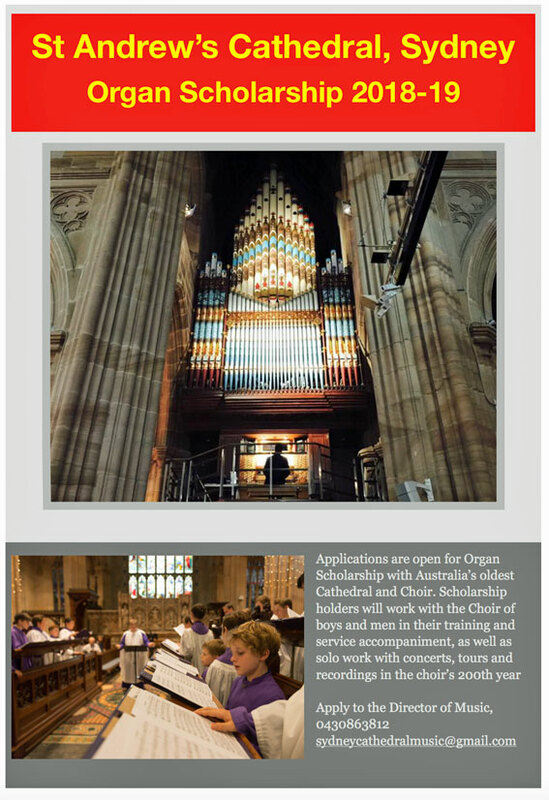 St Swithun's Anglican Church, Pymble, wishes to appoint an Organ Scholar, and seeks applications from young organists aged 18+ to work with its Organist Peter Hamilton, its Director of Music Phillip Linquist, and its RSCM-affiliated choir of about 40 singers. We note that accompanying choirs and hymn-playing get no mention in the AMEB or TCL syllabuses which focus on organ technique and solo organ repertoire. 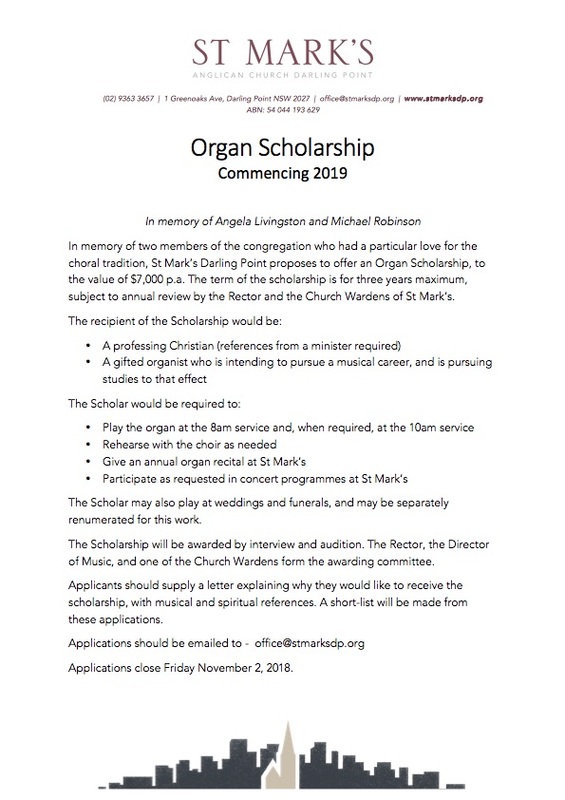 We envisage that the Organ Scholar will continue studying the organ with his or her present teacher, and will use this scholarship to enhance his or her skills in accompanying choral and congregational singing. We think it desirable that the Organ Scholar has attained a proficiency of at least 5th grade AMEB or TCL standards, is an excellent sight-reader, and has shown an aptitude for the art of accompaniment. Ideally, the applicant is a communicant member of a church. We expect the Organ Scholar to attend and participate in at least 60% of the rehearsals and services at which the choir is singing. Except in January, the choir rehearses every Thursday evening from 8 to 10, and sings every Sunday at the 10am service, once or twice a month at 8am, and sings Evensong several times each year – at St Swithun's and elsewhere. There are also special services near Easter and Christmas and generally three concerts each year. According to the Scholar's experience and skill, he or she may be asked to play the organ for parts or all of some of those rehearsals and services and concerts. The value of the scholarship is $5,000 per annum. The Scholar may also earn fees for playing the organ for weddings or funerals. The Scholar may use the organ at St Swithun's for practice or lessons whenever the church is available. The pipe organ has 3 manuals and 46 ranks, controlled by 37 stops and 6 couplers. The Organ Scholar is appointed by the Rector on the recommendations of the Organist and the Director of Music, and reports to the Organist. The appointment will be for a period of between 1 and 3 years (after a probationary period of 3 months). Note that tenure of all staff at St Swithun's is subject to meeting the normal requirements of an ecclesiastical workplace and participating in annual reviews. Please visit www.swiz.org.au for more information about St Swithun's. To apply for the scholarship, or to discuss the opportunity, please contact Peter Hamilton at peter.stives@bigpond.com or on 0414 477 352.